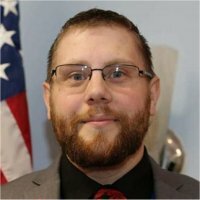 Nicholas A. Elizondo, 29, of Belleville, Illinois, formerly of Litchfield, IL, born Monday, October 9, 1989, in Springfield, IL, passed away Monday, January 21, 2019 at Barnes-Jewish Hospital in Saint Louis, Missouri. He was a member of St. Clair Lodge #24 AF & AM (current Secretary), Scottish Rite Bodies, and Ainad Shrine. He organized Blood Drives and Toy Drives for the Masonic Lodge. Nick was an Assistant Coach of the Litchfield Purple Panthers Football and Wrestling teams, member of FFA, Faith Lutheran Church in Litchfield, President of JILG ( Jobs for Illinois Graduates) and a member of Outreach Committee for Heterotaxy Connection. Visitation: Visitation from 4:00 pm – 8:00 pm, Friday, January 25, 2019 at Kurrus Funeral Home in Belleville, Illinois. Camp Jackson Fire Department walk-through will be held at 7:00pm followed by a Masonic service will be held at 7:30pm. Funeral: Funeral services will be held at 11:00 am,Saturday, January 26, 2019 at Kurrus Funeral Home. Words can not begin to explain how Nick touched lives. He owns a part of my heart. Love all of you. To Nick’s wife and family, My only interactions with Nick were online through our Heterotaxy group. I wish I had gotten to meet him in person. I am a few years old than Nick but didnt get diagnosed until I was 23 in 2011 and Nick was one of the first people to reach out to me and help me deal with my diagnosis. Even though we didnt know eachother in person he had such a huge impact on me, he gave me hope and helped me when I was scared. I would like for all those missing him to know that, he helped so many people, people he didnt need to help but did because he was a good man. I will forever be grateful for all he did for me as well as the others fighting Heterotaxy like me. To his parents, you raised an amazing man! To Katie, you brought so much joy into his life hold on to those happy times! Katey sorry for your loss, I cant imagine what you are going through. My family is praying and thinking about you. Sorry I cant be there at the wake but remember we are here for you . My deepest sympathies and condolences to Katie and all who loved Nick as a son, brother, uncle, or friend. I wish the best for you and you family! So very sorry for your loss! Keeping you all in our prayers during this difficult time. My heartfelt sympathy and condolences to Katie, family and friends! So young both of you. God Bless You and Nick’s soul! You will be together again! My sincere condolences to the Kurtz family. You are in my thoughts and prayers. My prayers and thoughts go out to the entire family. He will be missed by many. May care and love around you provide comfort and peace to get you through the days ahead. I pray that God will grant you the strength . I am truly sorry for your loss. Very sorry for your loss! My thoughts and prayers go out to you and all your family. “Don’t grieve for me, for now I’m free! I followed the plan God laid for me. I saw His face, I heard His call, I took His hand and left it all… I could not stay another day, to love, to laugh, to work, to play. Tasks left undone must stay that way. And if my parting has left a void, then fill it with remembered Joy. A friendship shared, a laugh, a kiss…Ah yes, these things, I too, shall miss. My life’s been full, I’ve savored much: Good times, good friends, a loved -one’s touch. Perhaps my time seemed all too brief–Don’t shorten yours with undue grief. Be not burdened with tears of sorrow, enjoy the sunshine of tomorrow.” Nick will be deeply missed. Our most heartfelt condolences. Sending lots of love & prayers!! Asking that the Lord to be with your family today & always. My thoughts and prayers go to your family. I am so sorry for your loss. I will always remember his smiling face and positivity! Jody, Mark and Katie: I cannot express deeply enough my sympathy at the loss of Nick. I didnâ€™t get to know him but we got know about him. He fought like hell for a quality of life for himself and others and that speaks volumes to his character. He left you a legacy to be so proud of!